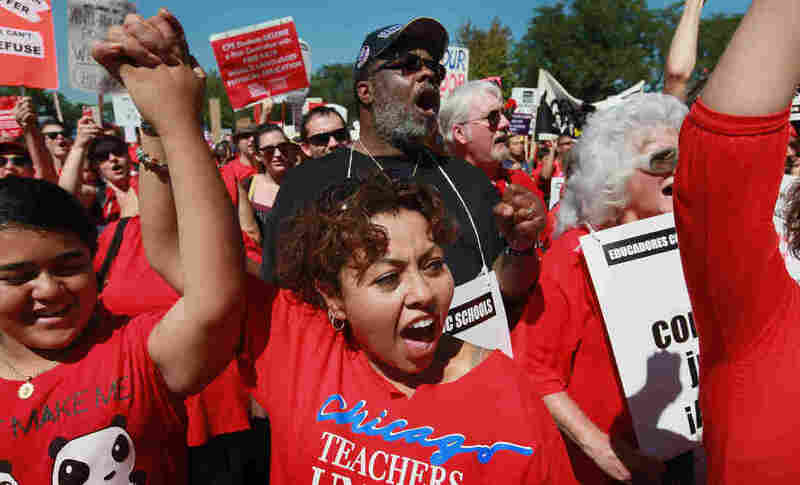 No Deal: Chicago Teachers To Continue Strike : The Two-Way The union's House of Delegates declined to vote on whether to end the strike Sunday after hearing details of a tentative contract agreement. Teachers will keep picketing Monday, one week after teachers walked out. Striking Chicago teachers and their supporters attend a rally at Union Park Saturday in Chicago. Chicago Mayor Rahm Emanuel says he wills seek a court order to end the teachers strike, and that the strike is illegal under state law. "I will not stand by while the children of Chicago are played as pawns in an internal dispute within a union," Emanuel said in a statement. "This was a strike of choice and is now a delay of choice that is wrong for our children. Every day our kids are kept out of school is one more day we fail in our mission: to ensure that every child in every community has an education that matches their potential." The Chicago mayor said the strike is illegal on two grounds — that it is over issues that are "non-strikable," and that the strike endangers health and safety of children. The Chicago teachers will continue its strike next week, reports the Associated Press. "The union's House of Delegates declined to vote on whether to end the strike Sunday after hearing details of a tentative contract agreement. Teachers will keep picketing Monday, one week after teachers walked out. Union president Karen Lewis says teachers want the opportunity to continue to discuss the offer that is on the table. She says the union's delegates will meet again Tuesday." The strike will continue to keep thousands of students out of class as parents and teachers struggle to find alternatives. As the Chicago Tribune reports, some parents are frustrated with Sunday's outcome. "It's very frustrating," said parent Humberto Ramirez of Jefferson Park. "We all kind of put everything on hold in finding different ways to watch the kids and keep them entertained. It's been very very frustrating, especially knowing that earlier (this week) that they were close, that they were simply going to be putting it to a vote. It certainly sounded as though they were very, very close and they were simply then dotting their I's and crossing their T's." Sunday's meeting follows six days of demonstrations, including a rally of thousands in Chicago's Union Park on Saturday. Teachers nationwide are watching the strike closely, as the outcome could influence the fate of other unions. As Alan Greenblatt reported for NPR last Monday, teachers unions have had to fight harder in recent years, even with their historical allies, Democrats. The strike in Chicago is the city's first in 25 years, a burst of frustration in response to an effort led by Mayor Rahm Emanuel to overhaul the education system. Tim Knowles, head of the University of Chicago's Urban Education Institute, told NPR's Tovia Smith it's "a prefect storm" of issues — one seen in cities across the U.S. Among the big points of contention are the tying of teachers' pay to student performance and job security with the expansion of charter schools and the closure of other public schools. The union's statement late Saturday said that the proposed contract includes provisions on pay, evaluation practices and job security. The union announced Friday there was an outline of a deal, but no details were released. While the final score in the negotiations is yet to be tallied, the Chicago Tribune says financial woes will hang over the outcome. "What remains to be seen, even if the strike ends Sunday, is how the agreement affects future relations between the union and mayor as the board struggles to find ways to afford the new raises, faces a projected $1 billion deficit in the 2014 school year and contemplates scores of school closings."